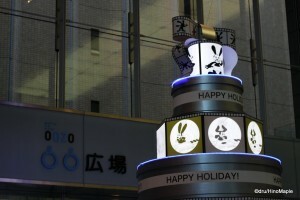 Last year I wrote a lot about the different major areas of Tokyo and what they were doing to celebrate the holidays. 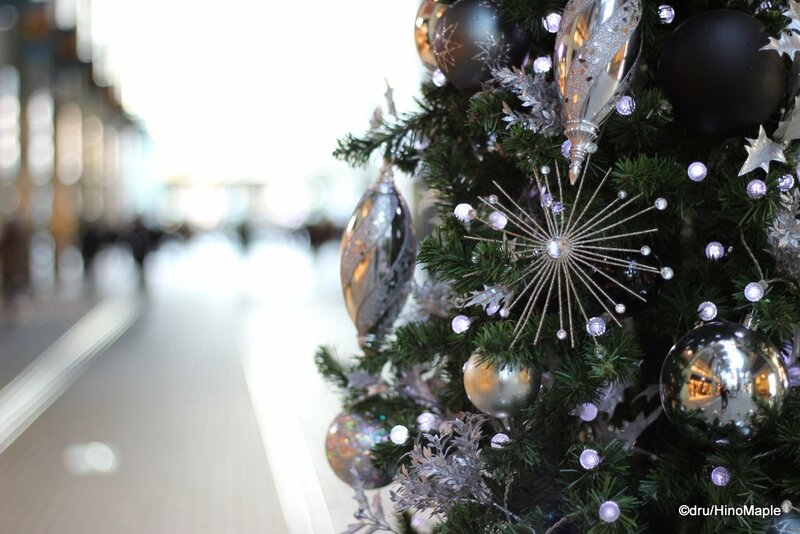 With the holidays in full swing, it is time to see what is new. While many of the Christmas decorations have made only minor changes from last year, this year Marunouchi is completely changing its theme. While the look is very similar to last year, they are collaborating with Disney and 4 properties have large “trees” with a Disney theme. 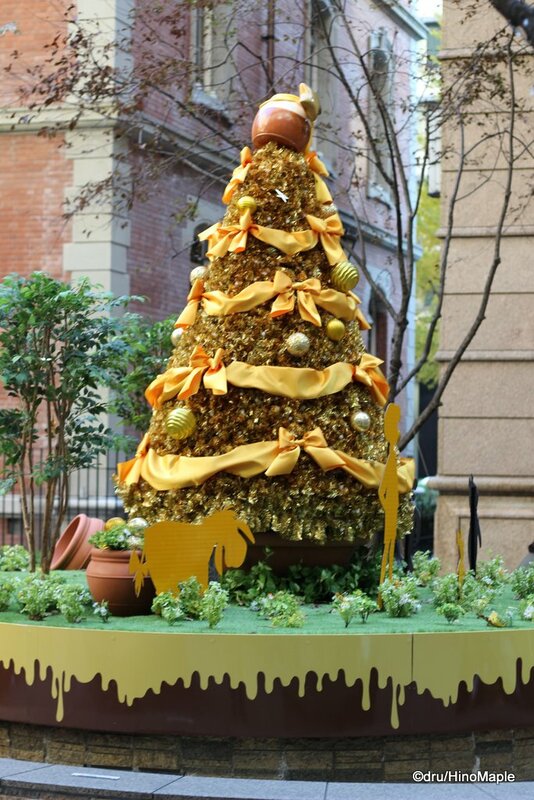 While all of Marunouchi has a slight Disney theme, Marunouchi Oazo, the Shin Marunouchi Building, the Marunouchi Building, and Marounouchi Brick Square have special trees and displays. You can even download a special app from Disney and interact with the various trees with special characters. I didn’t get a chance to try it though. From the sounds of things, it is a very immersive app with various augmented reality programs. When interacting with the trees on your smartphone, you can see various characters come to life on your screen while the camera is on. The photos look pretty interesting but I wasn’t in the mood to download it while I was there. If you are in the area, and you love Disney, you should check out the 2013 Bright Christmas, the name of the event. Even if you don’t love Disney, while you are there, you should still check it out. The Marunouchi area is not the only area to feature a Disney Christmas display as the Landmark Tower area in Yokohama also has a lot of activities in conjunction with Marunouchi. Both sites are unique so you can check both of them out, but unfortunately Yokohama is a little too far for me to visit. 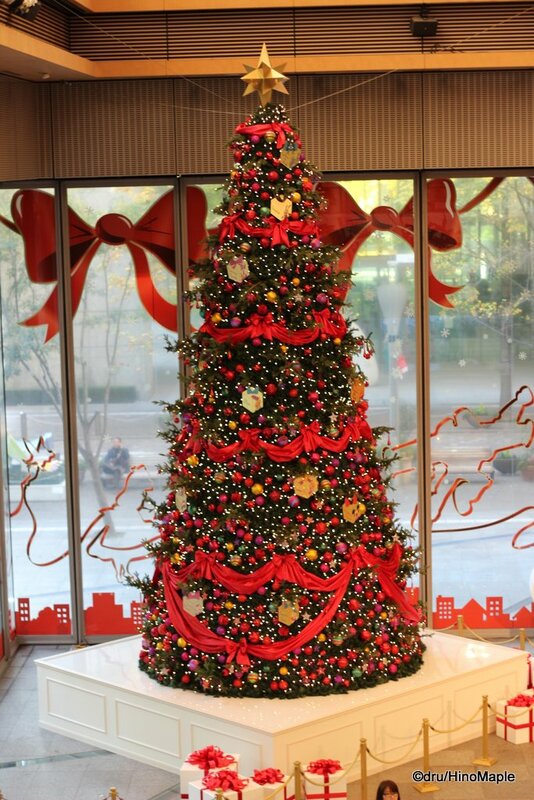 Marunouchi Oazo has a very interesting “tree”. It is the only tree that is designed alike a reel of film. With OSWALD the lucky rabbit being the main focus of this tree, you can see animated panels of his cartoons, probably the originals, as well as a few items that are for sale. The tree itself is not very interesting although I was intrigued by the choice of character. I had to do a little research into the character and discovered that Oswald was owned by Universal but created by Walt Disney. It took many years before they brought him back to Disney and now both own the rights to the image. Disney appears to be making a big charge to rejuvenate the character and they are making sure people know he is with Disney now. The Shin Marunouchi Building tree is a little difficult to find. It is located on the 3rd floor so you have to actually do a little “shopping” in order to see it. This is probably my favourite tree as it is the Disney Princess tree. While I don’t care much for the princesses themselves, the imagery of the women in Disney properties has been getting stronger over the past decade or so. The women are no longer very weak and frail as they once were and they are now becoming true heroines in their own right. 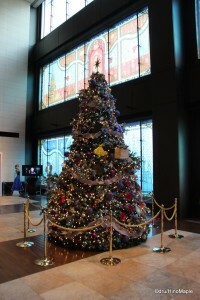 The tree itself is pretty interesting with various costumes and items from various movies being the main decorations. The windows have a special sticker to make them look like stained glass windows. 4 of the main windows have been changed to represent 4 different princesses. Rapunzel, Snow White, Belle, and Cinderella are featured on the windows, including their castles. Disney must also capitalize on this area and they were proudly showing the trailer for their new movie, Frozen, on a loop as well as allowing you to get pictures with cut-outs of the two princesses. The Marunouchi Building itself has the largest Disney display, but it is also the most boring for me. It is just a huge tree with various Disney characters on it. Next to the tree is a large balloon in the shape of Mickey’s head and a cardboard front that makes the entire assembly look like a hot air balloon. You can line up and get your picture taken as if you are inside the hot air balloon. On the opposite side of the plaza is a very interesting augmented reality device. They utilize something similar to an X-Box Kinect in that a camera records you and puts you on a big screen. As you perform various activities, you make the screen do various activities. For example, you can paint the screen with colours and other things. You can then take your own selfie while you pose with Mickey and Minnie on the screen. It looked like fun for the 2 girls, rather women, I saw playing with it. Otherwise, I wasn’t really interested in the display. The Marunouchi Brick Square has the only outdoor tree in Marunouchi. Last year was a very simple tree and this year they have the Winnie the Pooh tree. It is a very yellow tree with a nice pot of honey on top. It actually looks better in person and even though it wasn’t a big tree, it was nice to look at. Unfortunately the tree is designed to be viewed from one perspective only, meaning the back side of the tree is not as interesting. I still enjoyed the tree but by the end of December, I’m sure it’ll be pretty cold. I didn’t get a good look inside the building itself so I’m unsure of what, if anything else, there is to see. The entire display around Marunouchi is pretty nice. Even if you don’t like Disney, it is nice to check out the trees and get into the holiday mood. It still feels a bit early as I checked it out in the end of November but it was still fun. Unfortunately I am rarely in Marunouchi at night so it is unlikely that I will be able to see it lit up, if at all. I will be posting all of my good photos on Google+ in the coming days, and probably Facebook too. Be sure to check them out if you want to see more. If you want to know more about the other areas of Tokyo and what they have to offer this Christmas, you can check out my 2012 report as things have only changed a little in the other areas as far as I know. This entry was posted in Christmas, Tokyo and tagged Belle, Brick Square, Christmas, Christmas 2013, Christmas in Tokyo, Christmas Tree, Cinderella, Disney, Disney Christmas, Disney Princess, japan, lucky rabbit, Marunouchi, Marunouchi Brick Square, Marunouchi Building, Marunouchi Oazo, Marunouchi Red Brick Building, Oazo, OSWALD, OSWALD the lucky rabbit, Rapunzel, Shin-Marunouchi, Shin-Marunouchi Building, Snow White, tokyo by Dru. Bookmark the permalink. Nee man, Dru, man! 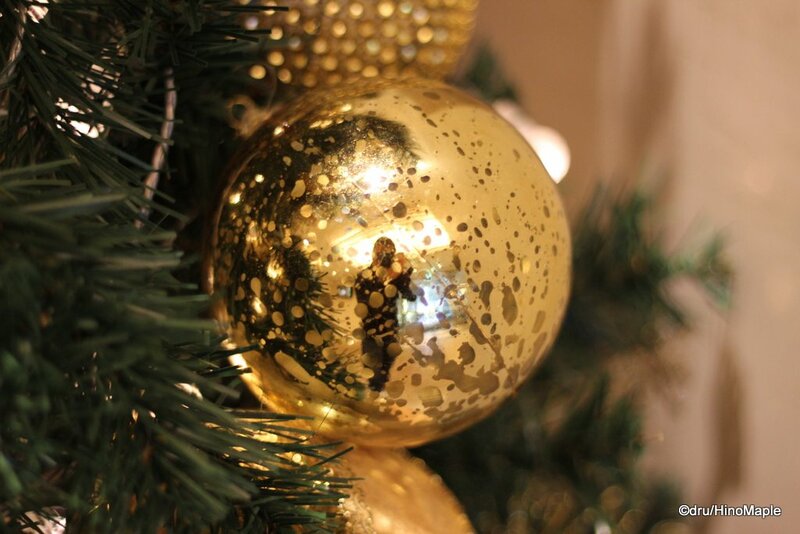 I was determined to ignore Xmas this year, but now you’re making me want to go to Marunouchi. Hmph. I still haven’t done any “illumination” photos yet. I hope to do some in a couple weeks. Too busy with work now. Actually, maybe this weekend I’ll get lucky and find time to take photos. I actually miss Shinjuku to be honest. Yurakucho isn’t bad either.